Vicari Auctions will be hosting the fourth annual New Orleans Classic Auto Festival with more than 200 classic and muscle cars to auction a swell as showcases and exhibits featuring many more. Growing to become one of the city's largest classic car shows, the New Orleans Classic Auto Festival is held every year in early August. This year features some beautiful machines, some of which will be available for purchase to lucky bidders. When the festival opens on August 9 at Mardi Gras World, classics from the J. Gordan Farmer estate will be put on the block. 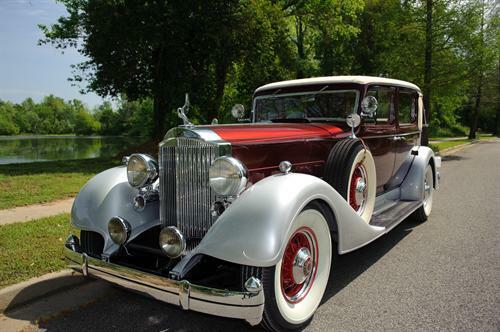 These include a beautiful 1934 Packard Twelve Club Sedan (shown) and a 1931 Packard Dual Cowl Sport Phaeton, one of the most sought-after classics of American history. The amazing V12, however, is often considered the pinnacle of Packard's designs with an elegant look that reaches through the ages. The Packard V12 seats five comfrotably on its 142-inch wheelbase and had top-shelf equipment such as shatterproof glass, fender lamps, and twin horns. The upgraded Pelican Radiator Emblem (also on this car for auction) was a $20 option - big money in 1934 - as well as a $14.50 automatic starter option and a DeLuxe Radio at a staggering $79.50 additional tag. Total list price before these options was a stately $4,060. The 1934 Packard V12 has been restored to show-quality condition. The 1931 Sport Phaeton is also show quality and features a wonderful look that most people associate with Packard. The 8 Series was built on an 833 chassis and incorporated a hinged tonneau cowl and rear single piece folding windshield. Other cars also going to auction are a 1965 Amphicar, also highly collectible, a 1947 Jaguar MK IV, and a 1952 Jaguar XK120, both of which are extremely beautiful cars that anyone would love to own. A variety of muscle cars of various descriptions are also hitting the block that weekend. Last year, the Vicari auction at the New Orleans Classic Auto Festival featured a 1957 Cadillac Eldorado Biarittz Convertible that sold for a breathtaking $178,200.